In my last blog I suggested you check out the vintage markets as a way to save money while still looking fashionable. OK, so maybe you don't go in for the whole retro thing, but you can still get the most bang for your buck if you're willing (and able) to invest in really, really great accessories. In my travels around the city and designer showrooms, I've put together a core group of what I consider to be worthwhile investments. For my money, the stuff I've selected will set you back a pretty penny. However every item will more than make up for the initial cost with many years of stylish (forget trendy, these are ultimately classics) wear. And no, you don't have to have Ivanka Trump's bank balance to afford anything I picked out. Trust me, I've got many years of experience as a (alright, say it) compulsive shopper behind me and I can separate the best from the blah! In the latter category, that includes this season's terminally trendy baggy pants which should have bitten the dust with M.C. Hammer. Even Katie Holmes looked crappy in her oversized, overpriced boyfriend jeans. Also on my hit list – the "can't walk in ‘em, feel like a clubfoot" sky-high clunky platform shoes and boots, and any giant designer handbag which weighs more than you. So let's get to it. These are some terrific, recession-proof items which make any wardrobe stand out from the crowd. I can't list prices yet as most of the stuff won't be available in stores till Feb for Spring ‘09, but you can get a jump on the competition. So START SAVING NOW! At FRATELLI ROSSETTI you definitely should consider investing in their sophisticated lace-up oxford shoe. It's truly elegant and unique in bone python and the classic styling will look fabulous forever – and that's probably how long these shoes will last. If you prefer something a little dressier or just don't wear flats, check out Rossetti's high heel, open-toe version with cut-out sides (very sophisticated '40’s looking) which will work nicely with a skirt suit, flannel slacks or that vintage fur piece your mother left you. And don't let the pale color throw you off, this is a year-round neutral shade which goes with everything. While COACH isn't usually considered in the designer bracket, it’s getting up there as far as price is concerned. Careful weeding out of the extensive Spring line, elicited some real winners in terms of savvy styling and wearability. I say skip the handbags (although they're chic enough) and concentrate instead on the fabulous ¾-sleeve soft-as-butter crop jacket. It has a spread collar, flap pockets and Coach's signature turn-lock closure. Along with the updated short belted trench, and grass green patent ballet flat - also with gold turn-lock hardware accent - these items will stand you in good stead practically year ‘round. Soft, easy styling is what's so appealing in ANDREW MARC's handbag collection. Buttery soft and capacious without being oversized, embellished or too heavy to lug around, are the hobos, satchels and totes from the Traveler range. Outside zip pockets add the only necessary details, while the ‘go with everything’ colors are: coffee, clover, straw and chambray. Think of this line as affordable luxury. DOONEY & BOURKE is always one of my fave collections to check out. While I would happily invest in practically any bag they produce (and believe me I already own more than my share, since they last FOREVER), this season I went ga-ga over their new limited edition Boldrini line. These are handcrafted in some of the finest Italian leathers. The heart of each bag is in the work of individual artisans - passed on from father to son (don't you just love it)? Each piece of leather is stitched; every braided tassel is carefully passed through nickel-plated grommets and finished off with the Boldrini insignia in elegant script. 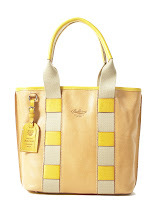 You must invest in the gorgeous medium ladder-striped bridle leather tote for years of wear. 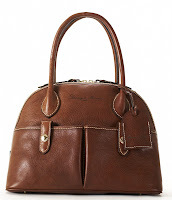 From the rest of the collection there are too many fabulous bags to list, but I loved the handsome Florentine Vachetta leather domed satchel with outside pockets in a rich chestnut shade. it is a state of mind when in the presence of this Dooney and Bourke bag! By now you know how I feel about PORTS 1961. Sure, their clothes are terrific and aimed at the fashion individualist, but I bet you didn't know much about their terrific accessories. Well, I'm here to tell you that on my last foray to the showroom I took a good look at them, in particular the shoes. I've narrowed down my choice to a pair of fashion-forward open-toe bone patent pumps. What set them apart were the beautiful wood cone heels. Not too high to actually walk in, they're a fresh throwback to the late '70’s cone-heeled shoes by Chloe. They were fabulous then and this updated version is fabulous now. Bonus points for the comfort factor! I walked around in them and definitely give them a thumbs-up. Designed by Julia Lundsten for Ports, she's known for deriving inspiration from natural architecture while her color palette reflects organic stimulation. 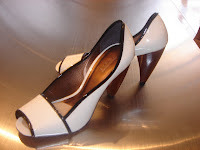 Note that her heels are a recognizable trademark, often made from sustainable exotic hardwood. Whew! So pass by those over-saturated Manolos, Jimmy Choos and Louboutins and go for something truly special. Your 401k is now a 201k, but is not too late! Invest wisely now and get a pair of these from Ports 1961. That's all for now, so start saving….you really don't need that 401k. Instead put your money on some fabulous Spring items. You'll feel lots better and if you have to go job hunting, you'll look DIVINE!